Breakout outside Acceleration bands suggest a beginning of a strong rally or a sell-off. Closing inside the bands afterward signals about the end of a rally or a sell-off. Acceleration Bands principal use is in finding the acceleration in currency pair price and benefit as long as this acceleration preserves. Acceleration bands are set as an envelope around a 20 period simple moving average on equal distance from it. Headley, the inventor of Acceleration Bands indicator suggests using them on weekly and monthly time frames to determine price acceleration breakouts (breakouts outside the bands). When Acceleration Bands are used for smaller time frames, upper and lower bands are treated as levels of possible support and resistance. 2 consecutive closes outside Acceleration Bands suggest an entry point in the direction of the breakout. Then position is kept till the first close back inside the Bands. How do I download band to my metatrader platform? It will not download. Besides you can create a file called indicatorname.mq4 right on your computer and copy a code you see on the screen there. 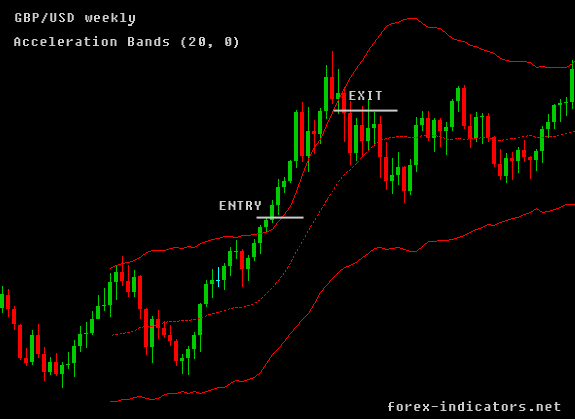 Acceleration bands can be used for both: Long and Short entries. 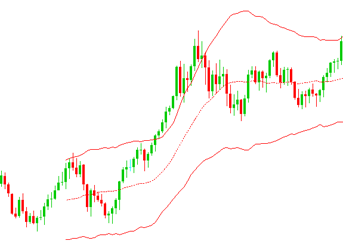 For short entries we have to have the price traveling outside and below the lower band of the indicator. After Compile Acceleration_Band indicator is not in custom indicator. I like your site, very practical with a lot of useful information but I can't download any of the indicators. Is there any problem? Have they been removed? 2. Choose "Save as.." or "Save link as.." or "Save target as.." to download the indicator. I have tried to download indicators,they appear in the program file okay but when I open MT4 I cant locate them.Any help appreciated. the Accel.Band just use Keltner Channel 20x2.5 and you have the exact indicator. First of all I want to thank you for this great site as newbie I started to learned a lot. Please help to explain how to use the Efficiency Ratio.